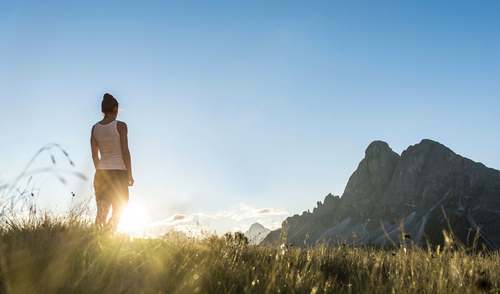 Wheather if you want to hike by yourselfe or in good company with our expert hiking guides, our hotel is the perfect basecamp for your holiday in the Dolomites. Come and join us on our weekly breathing hike into the Natural Park of Schlern-Catinaccio and enjoy the power of your breath. Surrounded by powerful forests, pure mountain air, wild rivers and beautiful watherfalls, the Vitalpina breathing concept brings you back in the unique surrounding of the Dolomites to healthy breathing and powerful living. 7 nights with healthy sleep in our natural rooms "alpine style"
mistic SPA area "cult place for body and soul"
mistic salt cave "silence deluxe"
1 SPA voucher of € 15,00 for a massage or micro-damph-bath "Vitalis"
For us, the principle of Alpine wellness is a natural way of finding relaxation. High-altitude hikes or snow shoe tours help your body and mind to find inner peace and harmony. Our Alpine wellness facilities make it easy for your body to restore its energy levels and healing powers. Our aim at Hotel Europa is to show you a good time but also improve your health. Large heated indoor pool with jacuzzi, four theme saunas dedicated to the herbs of Alpe di Siusi, pinewood profume, cult places and a unique cinema sauna with best pictures of owner and natural photoprapher Michael Trocker photography©. A stay at our hotel, therefore, is a winning combination of active vacations and wellness vacations in South Tyrol. Traditionally, mountain people tended to have to rely on themselves to find their way out of precarious situations. The healing powers of the body, therefore, were of utmost importance to the locals, and they used herbs and plants to help themselves. It is thanks to this that today the inhabitants of the area have collected a wealth of knowledge of the local nature and its healing potential. Thus, in our hotel we focus on healthy, natural treatments using local herbs and substances, such as hay baths, common spruce steam baths, apple and rose hip treatments, Vitalpina massages, herbal stamp massages, sound massages and many other services. Professionals in hiking! We are member of Wanderhotels_best alpines® and Vitalpina Hotels®. Qur goal is to show you on professional guided hiking tours through the most beautiful mountains of the world, the Dolomites, the beauty of our nature and hidden secrets of the landscape. Enjoy on 5 - 6 guided tours per week the unique experience of personal hiking guides on the most beautyful trails on Alpe di Siusi, Natural Park and World Heritage of Mount Sciliar, Catinaccio or Val Gardena. Our speciality is the ancient cult places on Mount Sciliar, the natural power places above Siusi, the healing plants on Natural Park Sciliar and the force of the nature on men's health. Our four well trained hiking guides are exclusively at your service and will guarantee you exiting and unforgettable experience in the Dolomites. Since 1995 we are on our way to offer you the perfect hiking service for your stay in the Dolomites. 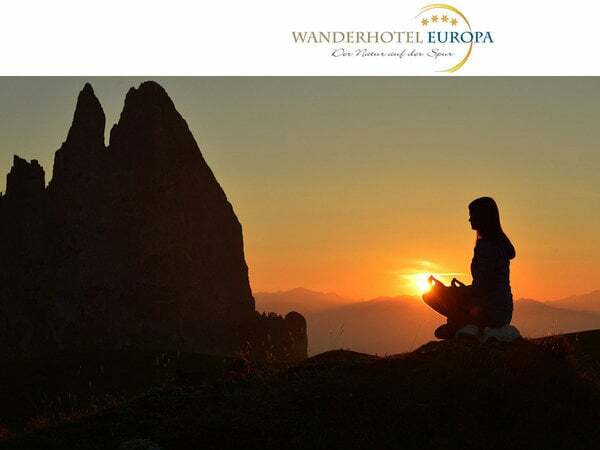 Therefor we are certified as "best alpine" partner Europa-Wanderhotels.